Our design for this pendant has been based on the design found on the floor of the rotunda in the Main Building on campus. 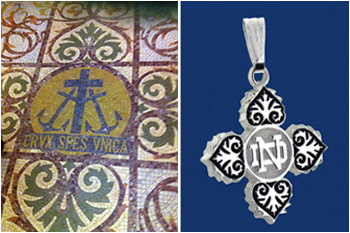 Through the help of the Archives Department on campus, we learned the design on the floor is the seal (which has evolved through the years) of the Congregation of the Holy Cross Order founded by Fr. Basil Moreau in 1835. The anchor symbolizes the cross as the anchor for the Christian faith. Fr. Moreau had a strong devotion to the Holy Cross carried by Jesus on the road to Calvary and one of his favorite hymns "Vexilla Regis" which dates back to the sixth century contains a sentence "O Crux ave, spes unica" (Hail the Cross the one hope."). The words "CRVX SPES VNICA" found as part of the design in the rotunda, computer translated, means "Cross is our only hope". We questioned the "v" in the CRVX and VNICA instead of a "u". 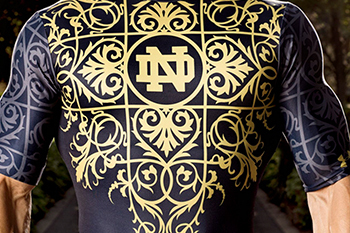 We were told Latin didn't have the two separate letters. When modern people wrote Latin they often used letters like "u" that weren't originally part of the language. An interesting excerpt is found in the Scholastic dated 1882 which gives light to how old the design is. "On their return in September , the students will be delighted to see a grand tile pavement in the Rotunda. The design was furnished by a former student, Mr. Arthur Hatt, of '78, and the "old liners" who remember Mr. Hatt's artistic taste need not be told that it is a thing of beauty." J. Arthur H. Hatt was a head designer for the U.S. Tile Co. in Indianapolis, IN. 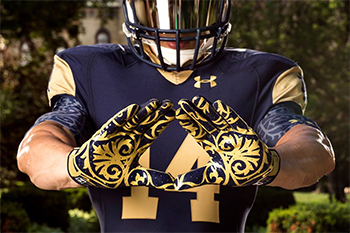 For the 2014 Shamrock Series game against Purdue, UnderArmour also used part of the design on the undershirt and gloves of the Notre Dame football players' uniforms.